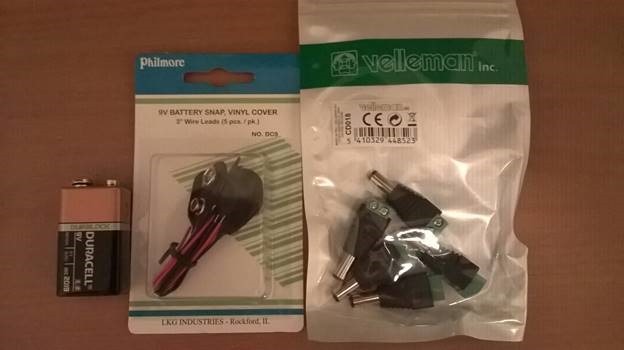 When you are planning to build your own device you should think about power. In some cases it’s OK to connect your device to the nearest socket but for some projects it will not work. Just imagine a robot, which requires access to socket. So, we need to use independent sources of power like batteries. Finally, I spent about 2 minutes in order to assemble all components together and check that everything works fine. Right now I have an independent power supply and I may build something like a robot or a flying drone. In order to build a robot you need to work with motors. There are three general types of motors: DC motors, Stepper-motors and Servos. DC motors work based on electromagnetism and are used to rotate an axle continuously. You cannot control angle of rotation, so, usually this type of motors is using to turn wheels. Stepper-motors allow to rotate axle step by step in fixed number of degrees. You should use this type of motors if you need good accuracy there. A simple example of Stepper-motors is second hand in many battery-powered clocks. Servos are very popular in robotics because they are used in order to create joints. They cannot turn continuously but they can move to fixed number of degrees in both directions with great accuracy. Therefore in order to realize legs, hands, fingers etc. you will use servos. Today I decided to make some experiments with a DC motor. Usually, DC motors have their own power supply, because they require more voltage than Galileo might give. At the same time we need a way to manage the source of external voltage in order to start and stop our motor. Of course, we may use relay and some components in order to do it or special motor shields but the best way is using a small control chip. This is L293D chip, which allows to control up to two DC motors. I don’t like special motor shields, because they require a lot of space, they are expensive and limited to 2-4 motors. So, if you need more motors, you need to buy one more shield etc. In case of L293D, the chip is pretty small, cheap and you can put as many chips as needed on your breadboard. The chip allows to use up to two motors. 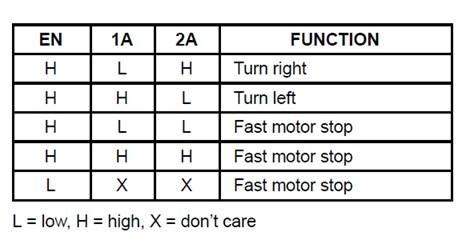 Because I have just one motor, I will not use 3A, 3Y, 4A, 4Y, 3,4 EN in my example. There en, a1 and a2 are numbers of digital pins, which you use in your Galileo in order to communicate with chip. 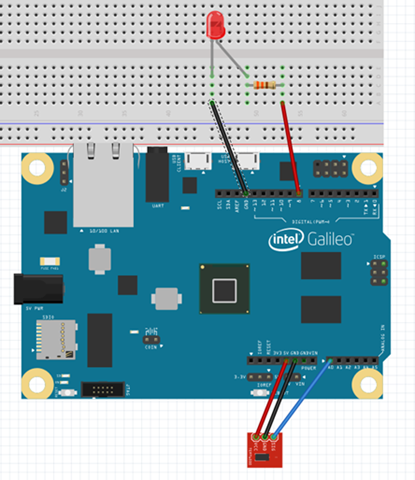 Today I am going to continue my series about Galileo 2 board for beginners and I will discuss analog inputs. But before it, I want to discuss resistors as well. We already used several resistors in our projects in previous posts but it’s still too hard to understand a value of particular resistor. There are two ways to do it. First of all we may use a multimeter device. You can buy it in any electronics shop. 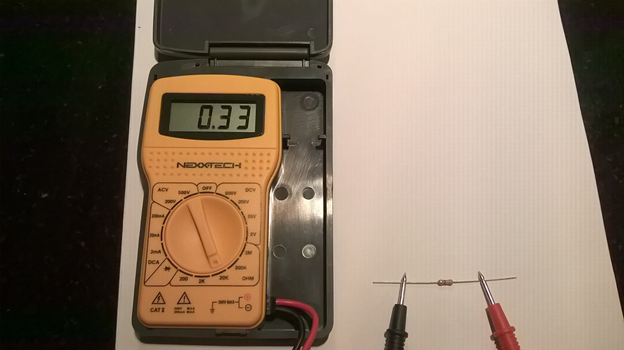 If you want to find a resistor in 330 ohm you need to set the dial of multimeter to 20 KOhm and touch red and black probes of multimeter to different legs of the resistor. You will see something around 0.330 for 330 ohm resistor. At the same time it’s not easy to find a right resistor among many types of them. Here is my box with different types of resistors and there are about 4 resistors in 330 Ohm only. Probably I will spend up to one hour in order to check all of them. So, if you have resistor with 4 bands, you will not use 3rd band column. Just find the right number for the first band and the right number for the second band and combine them to the one number like <first number><second number>. And multiply this number by multiplier in order to get the final resistance. 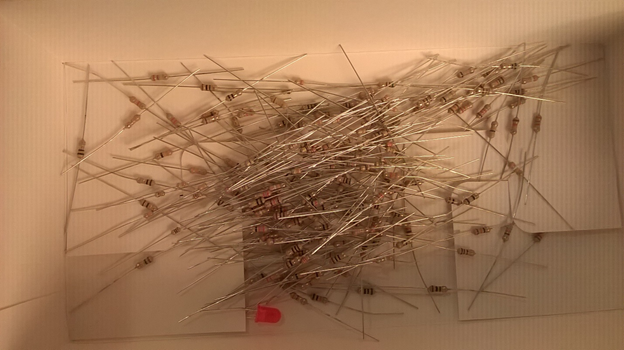 That’s why we need <Orange, Orange, Brown> forth band resistor in order to get 330 Ohm resistor. 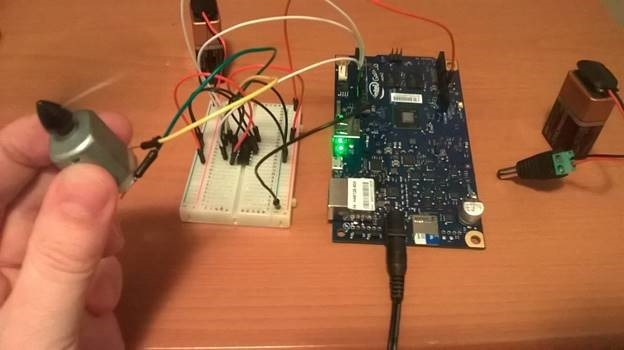 Let’s start to create a project based on sensors, which can send inputs to our board. I wanted to use a flame sensor in the first project but today I woke up at 4 A. M. due to fire alarm in my building. Probably somebody forgot to turn off a stove or something like it but buzzer’s sound was terrible and I decided that it was a sign to stop my experiments with flame. 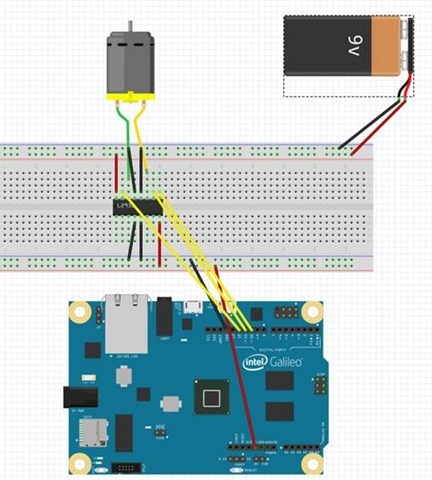 So, we will use a photoresistor sensor. 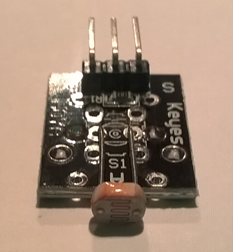 It has three legs, which should connect your sensor to power, ground and analog input pin on the board. You should check the datasheet for your sensor in order to understand how to connect it. Galileo convertor will convert the analog input to a number between 0 and 1023. In this code I decided that if our number is smaller than 700 (resistor resists enough voltage), we will switch off our led because we have enough amount of light. If our resistor doesn’t resist enough voltage (it’s dark) we will switch on out led. Based on this example you are able to make many experiments with light and analog input. Since we are using Visual Studio, it’s easy to launch our projects in a debug mode. When you will stop debugging, Visual Studio kills your process automatically. Visual Studio allows us to set breakpoints and review variables values etc. You may also use the Log method in order to print something to the output screen in the Debug mode. If you are launching your application without Debug mode, you need to kill your process using the Telnet as I mentioned in previous articles. So, Visual Studio makes our life better but there still is a question: how to launch our projects just after startup of our operation system. It’s very important if you already created the final version of your project. Because we are using Windows, it’s easy to do in two steps. First of all you need to navigate to the following folder: \\mygalileo\c$\Windows\System32\Boot. You will need to enter your credentials there. On the next step, change autorun.cmd file and put one more command there, like start YourFolder\YourApp.exe. That’s all and your application will launch on the system startup. Today I will finish my post. Next time I am planning to show more advanced projects.